We all know of school bullies and, unfortunately, some of our kids may even have been the subjects of bullying. In situations like this, we usually look to our kids’ teachers for guidance and support. But what do you do if the tables were turned and you suspected your kids were having difficulties with their teachers, rather than with their peers? In my son’s school, the teachers make it a point to write a report to the parents when the child is caught misbehaving. My 5-year-old son has had his share of reports, but I began to notice that there was one teacher who was too “report-happy”. She’d often write lengthy reports even if the incidents were after school hours and had been resolved privately. I also noticed that when it came to my child being bullied, even being punched in the stomach and having his pants pulled down in public by an older student, no reports were being written against them. There was also a time when my son’s grandmother had come to pick him up from school earlier than usual and saw that he had gotten punched in the shoulder. Not wanting to intervene and watching from afar, my mother watched my son go up to said teacher to report what had happened only to be brushed off. This understandably angered my mother and made us feel like there was some sort of bias against my son. I discussed this incident with the school’s guidance counsellor and asked her if she felt that it was fair that several reports were being written against my son, but none when my son was the one being physically mistreated. After the meeting, I never received a report again. So what would you do if you suspect your child is having difficulties with a teacher at school? 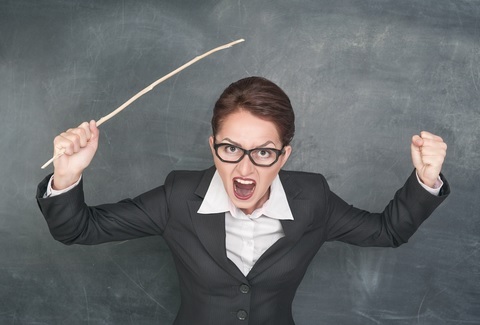 Teacher bullying may be more common than you think. Dr Stuart Twemlow, a psychiatrist, conducted a study on ‘teacher bullying’ a few years ago, the results of which were published in The International Journal of Social Psychiatry. According to him, the problem may be more common than people believe. This could be as blatant as physical punishment, or more subtle such as using sarcasm to humiliate a child in front of his or her classmates. While Twemlow insists he’s not trying to victimise or criticise teachers in any way, he argues that nevertheless, teacher bullying does happen. Why does ‘teacher bullying’ happen? 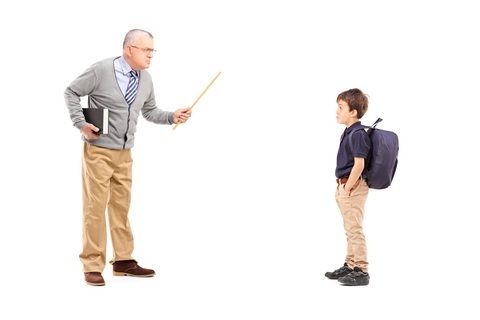 A student may remind a teacher of someone he/she dislikes. Sometimes, insecure teachers may bully bright students out of envy. According to Twemlow, in some schools where students actually bully teachers, teachers may do the same to certain students to avoid appearing weak. They were bullied themselves as children. Harassment of a child, whether by peers or teachers, is unacceptable. Twemlow identifies 2 categories of ‘bully teachers’: ‘sadistic teachers’ and ‘bully-victim teachers’. The sadistic teacher hacks on kids in a way that indicates they might get some pleasure from it. That means humiliating students, hurting students’ feelings, and being spiteful. The bully-victim teacher usually is passive and lets a class get out of control and responds with rage and bullying. These bully-victim teachers are often absent from work, they fail to set limits, and they do a lot of referrals to the principal because they like other people to handle their problems. We also spoke to clinical psychologist Rachael Tan for her expert opinion on this issue. How do you know your child might be having difficulties with a teacher? What are the signs and symptoms to watch for (and any other red flags)? Unless your child has explicitly mentioned that they are having problems with a teacher, it can sometimes be difficult to know for certain that this is happening. Cognitive symptoms, such as constant worry about negative experiences relating to the teacher, difficulties concentrating during classes with the teacher, which may lead to consequent decreases in achievement. Encourage your child to talk to you if you suspect he/she is having difficulties with a teacher. How can you help your child at home if you suspect he/she is having difficulties with a teacher? What kind of questions can you ask your child to encourage him/her to talk to you? If your child hasn’t already approached you to talk about the issue, you may like to broach this gently, as you don’t want to unwittingly create any additional stress for your child. Asking your child generally about school, then narrowing in on the topic, for example, by asking about their favourite friends, classes and teachers. See if there is a change in their expression or willingness to talk when the specific class teacher is brought into discussion. Engaging in a drawing or writing activity with your child, about the things they like and dislike about school. You can then use the information they have presented to explore what and why they both like and dislike what they do. If your child is able to read and write independently, you may like to write them a letter and allow them to respond to you in their own time, so they do not feel pressured to give you answers immediately. What can you do if your child is not talking to you about the issue? Rather than force your child to disclose information to you, focus first on creating a “safe space” for them to bring the issue to you on their own. You can do this by generally assuring them, for example, that you always have time if they need to talk to you, and that you will always be there to help them if they are having difficulties with anything. You can be proactive about helping your child find solutions to deal with the situation, for example, by helping him/her learn general assertiveness skills, and identifying safe people at school they can talk to if they need help with things. You can also have conversations with your child where you offer them examples of your experiences with similar difficulties, and how you have worked through those. Make sure you do this in child-friendly language that your child will understand. You can then build on this by asking for their advice on what they might be able to do if they experience similar difficulties. If your child talks about teacher bullying to you, do take him or her seriously and investigate further. If you are certain that a teacher is making things difficult for your child, you may like to approach the teacher to discuss this. If you do not want to question the teacher directly, you can simply express that you have noticed changes in your child’s mood and/or behaviour at home and that you would like to know if they (the teacher) had any thoughts about whether anything at school may have contributed to this. Should this discussion not result in a satisfactory resolution, you may like to consider setting up a meeting to speak with a senior staff member at the school. When should you seek professional help and who should you see? If you feel your child has become significantly distressed and would benefit from learning how to deal with the impact these difficulties have had on them, it would be advisable to seek help from a qualified professional such as a clinical or developmental psychologist, social worker, or counsellor, who is well-versed in topics of child development. If all other options and efforts fail, consider moving your child to another school if this is an option, but try to include your child in this decision as it will involve a relatively big change for him/her. theAsianparent would like to thank Rachael Tan for her valuable information on this topic. We hope you found this article useful. Has your child experienced difficulties with any of their teachers? What’s your opinion on this issue? Share your thoughts with us by leaving a comment below. This article was originally published on theAsianparent Singapore. Republished with permission. Twemlow, S. et al. 2006. Teachers who bully students: A hidden trauma. International Journal of Social Psychiatry; Vol 52(3): 187-193.